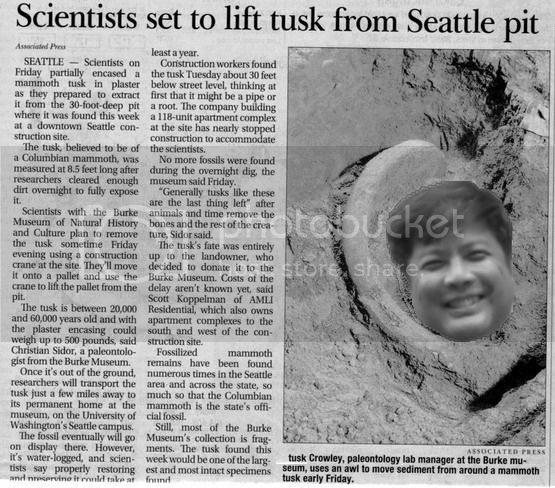 TUSK is in a Seattle Pit !! Looks like Haley's Mammoth Supporter will get Plastered in Seattle! RE: TUSK is in a Seattle Pit !! Actually, as of yesterday afternoon, Tusk is safely ensconced in the Burke Museum. I thought you meant "mosh" Pit, I went out last night with some friends to Seattle's legendary Crocodile to enjoy some bands. Current time: 04-23-2019, 10:47 PM Powered By MyBB 1.8.19, © 2002-2019 MyBB Group.